Instead of featuring a wedding or a shoot today, I've decided to share a little piece of my heart instead. Originally I was going to post this on my personal/photography blog, but decided to share it in here because it's about this blog. I watermark all the images that I feature on my blog with the photographer's website. I link all images to go to the photographer's blog or website. I put the photographer's name in the title of the post. I do all this because I want to give my featured photographers as much exposure as I possibly can. I care about the photographers that I feature.. I really do. So if you ever decide to submit your work to Le Magnifique, know that you are in good hands. I didn't post those stats or "things I do" to brag or make me seem better. I posted them because it's something I am proud of. Since the launch of the blog, I have not made a single dime off this site and that's because I wanted it to be that way. For the past 6 1/2 months, it's been a labor of love and it has made me love doing what I do so much more. As per request of tons of photographers, I am going to start selling ad space this summer (so if you're interested, stay tuned!). With all that said, I just want to share a little piece of my heart and shed some light on who I am and what I do besides blogging here. I am happily married to the most amazing, hard-working man I know. We've been married for over 2 years now (3 years this November). We don't have any kids yet but we do have 2 dogs; a Biton (Bichon Frise/Coton de Tulear) named Nala, 6 1/2 years old, and a Siberian Husky named Max, 4 months old. I work a full-time job, Monday through Friday. My Saturday's are usually spent cleaning up the house, doing laundry, hanging out with my siblings, working on the blog, or doing a shoot of some sort. Sundays are spent with my husband, church, Disneyland, going somewhere, or working on the blog. This blog is practically a full-time job because I work on it for hours when I get home from work. There are times when I don't answer emails right away or a feature gets delayed. Thankfully, everyone has been patient and understanding. I don't think most people know that I do have a full-time job outside of this blog. I'm the only writer here but sometimes will say "we".. but that's only because it sounds better than "me" or "I". If I'm being honest with you, there have been times when I just wanted to drop it all because it got so stressful. But I have an amazing support group who encouraged me to continue moving forward. I really enjoy what I do. It's fun. I get to "meet" new photographers and develop a friendship with them. It's amazing. So if you're reading this post today, thank you. Thank you for stopping by and checking out my posts. Thank you for leaving comments not only for me, but for the people who have been featured on my blog. Thank you for telling your friends about my blog. Thank you. Thank you. Thank you. I am so grateful for every single person who stops by my blog. I really am. Thank you. And because pictures make posts so much better, Here is a photo I took with my phone of a photo on my camera. 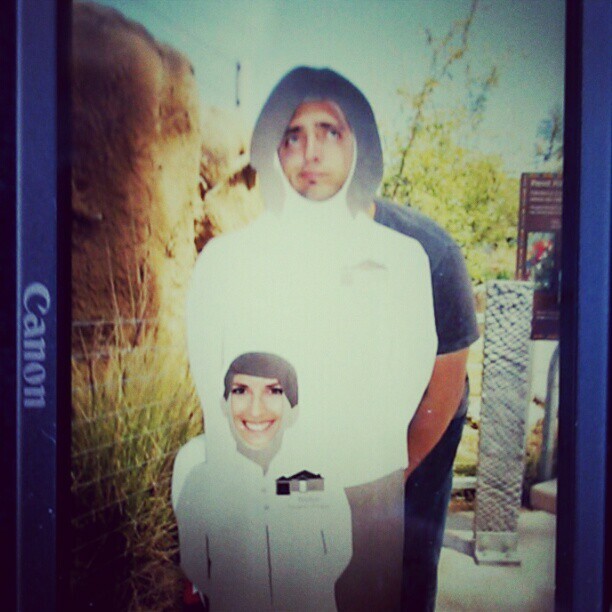 This photo was taken yesterday at the San Diego Zoo. That's little me at the bottom and my husband at the top. Happy Monday!